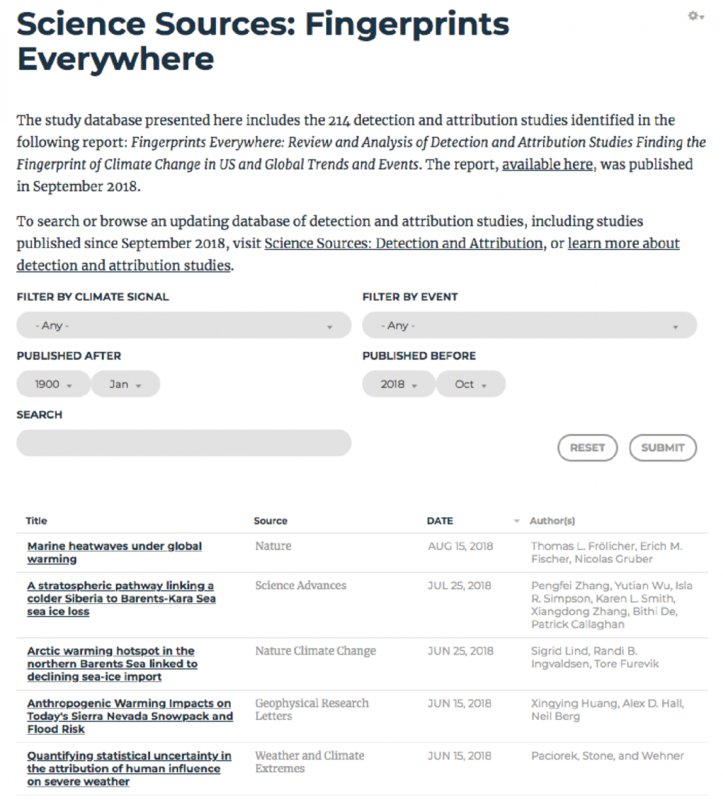 Climate Signals conducted a detection and attribution literature review of climate change studies since the 1990s that show human-caused climate change has had a significant and direct influence on observed trends and events. The report is limited to detection and attribution studies on climate impacts in the United States and studies of global significance. It does not assess the robustness of the statements or methods used by individual studies. Studies of global significance include those attributing global warming to changes in large-scale dynamic and thermodynamic processes that have complex and far-reaching impacts, such as long-term global temperature rise and atmospheric moisture increase. It also includes studies on changes with global implications, such as ice sheet melt and Arctic sea ice decline. Finally, studies of global significance include those on topics of general concern, such as coral bleaching in the Great Barrier Reef, a world heritage site. It does not include studies of primarily local significance outside of the United States. The report is a response to the need to better understand the breadth, depth and character of the research identifying the influence of human-caused global warming on observable impacts. 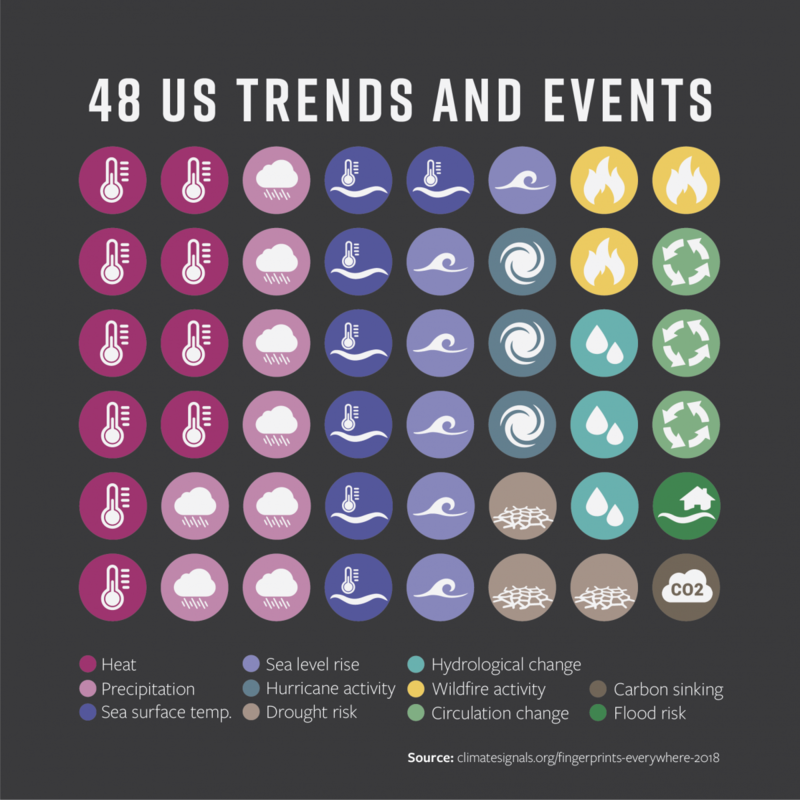 Among 93 studies with findings specific to the United States, climate change was found to have a direct hand in 48 trends or events. 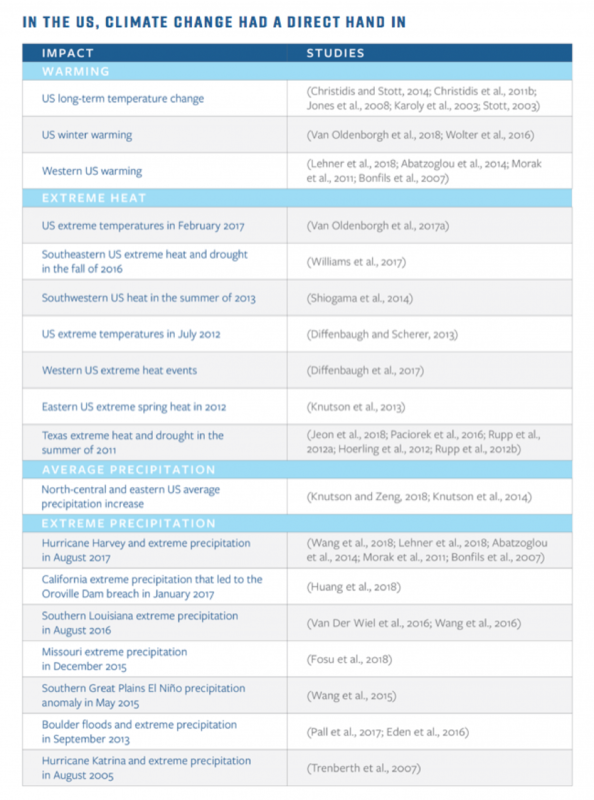 In the US, human-caused climate change is directly implicated in rising and extreme temperatures, coastal flooding, extreme precipitation events, reduced snowpack and hydrological changes in the West, increased average precipitation in the Northeast and North Central US, increased drought risk, extreme hurricane seasons in the central Pacific, changing atmospheric patterns, and heightened wildfire risk. 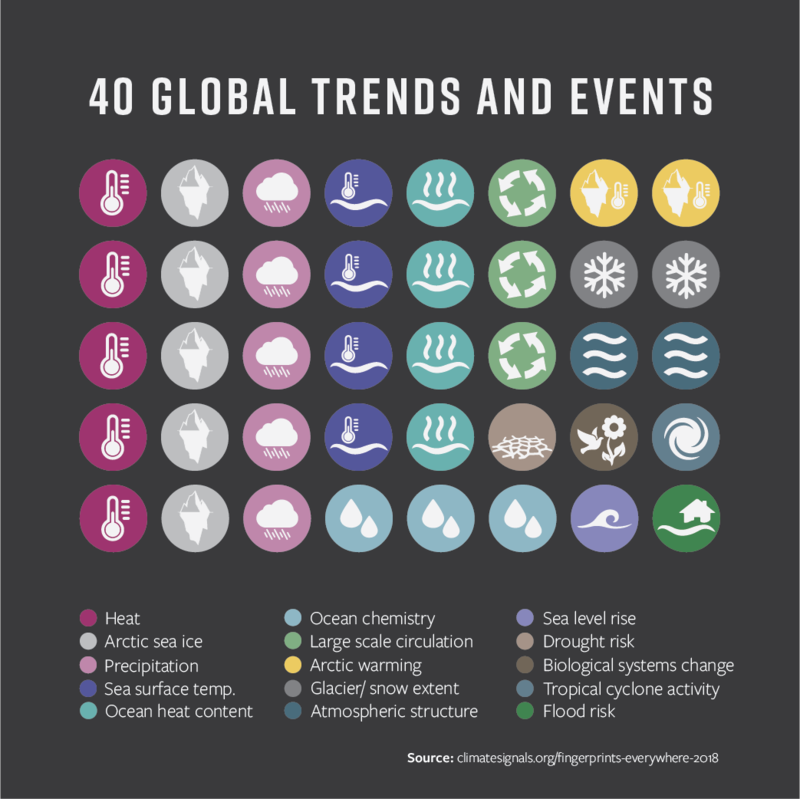 Among 128 global studies, climate change had a direct hand in 40 distinct trends and events. 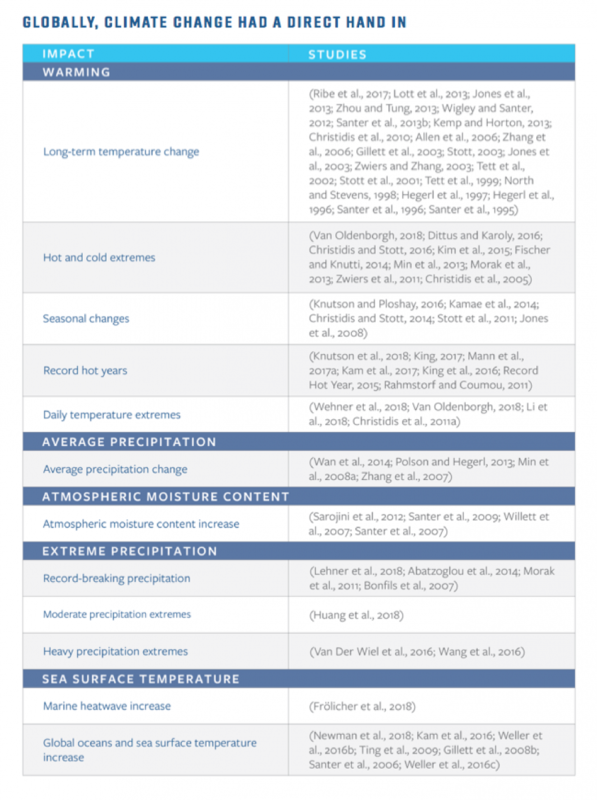 Globally, climate change due to human activity is directly implicated in long-term warming of the atmosphere and ocean, record-breaking and extreme heat events, changes in average precipitation and atmospheric moisture content, extreme precipitation, sea level rise, extreme Arctic warmth and sea ice loss, tropical cyclone activity, ocean chemistry, biological systems, and large scale circulation. 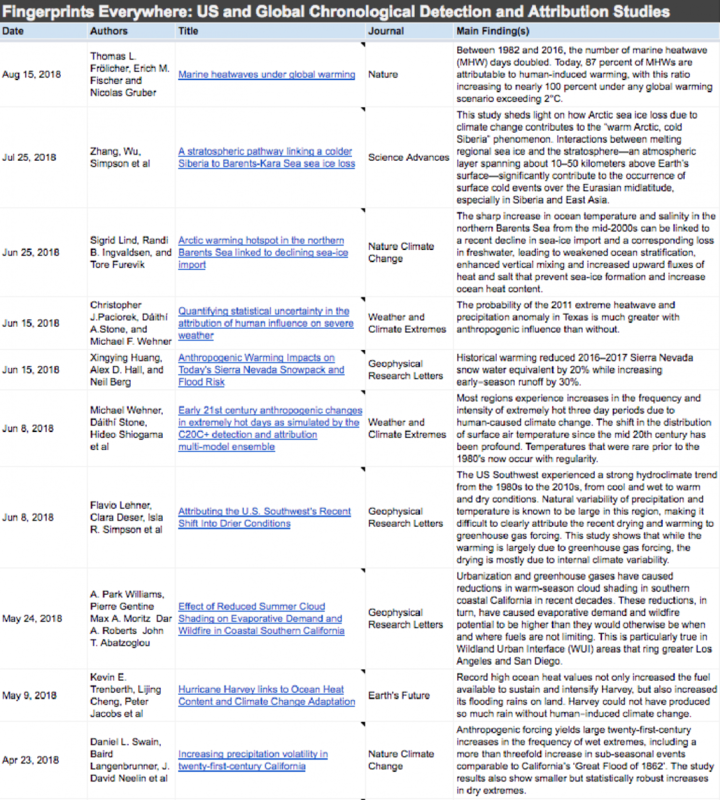 For a filterable list of studies included in the report go to: climatesignals.org/reports/attribution-report. Climate Signals will also update, in real time, a database of detection and attribution studies as new research is published at: climatesignals.org/reports/attribution. Note: The balance of global versus US trends and events reflects a well-known sampling bias in the literature. The distance between the lead author’s home and the trend or event being studied is not a random variable. Researchers tend to investigate things in their own country. Recommended Citation for Report: Andreatta R. and Cutting H. (2018). 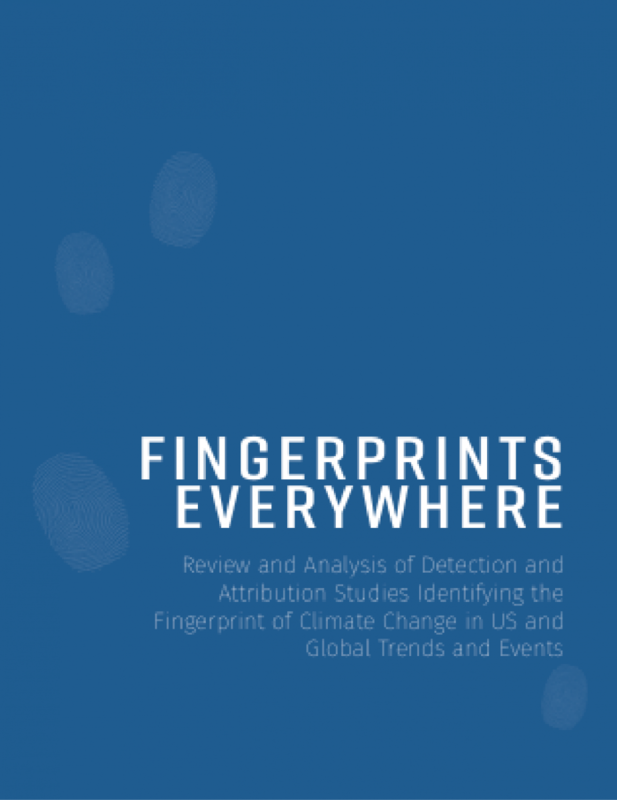 Fingerprints Everywhere: Review and Analysis of Detection and Attribution Studies Identifying the Fingerprint of Climate Change in US and Global Trends and Events. Climate Signals/Climate Nexus. New York. © 2018 Climate Signals, Climate Nexus. Available for reuse and adaptation with attribution under a CC-BY license. Climate Nexus is a foundation-funded nonprofit communications shop focused on climate change and clean energy. Climate Signals is a science platform for cataloging and mapping the impacts of climate change. Currently in open-beta release, the platform is designed to identify the chain of connections between greenhouse gas emissions and individual climate events.